Inspired by the Finnish sauna tradition of Northern Michigan, our unique pure essential oil blend features stimulating sweet birch, soothing sassafras and the grounding aroma of fresh juniper. This clean burning soy votive candle helps to open the breathing passages and purify the air, filling your space with the refreshment and cleansing power of the North Woods. Contains Pure Essential Oils of: Sweet Birch, Cedarwood, Juniper Berry, Balsam Fir, *Organic Eucalyptus, *Organic Lemon, Red Cedar, Grapefruit, *Organic Lavender, Allspice, *Organic Peppermint and Clove. 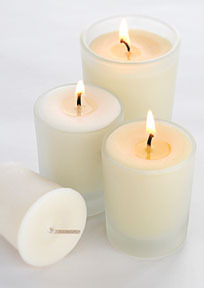 (*Certified Organic) 100% Plant-Fiber, unbleached wick. 16+Hour Burn. Must be burned in appropriate votive container (not included).